Shockwave is my one and only favourite decepticon aside from Transformers the movie Blackout(Blackout is the coolest transformer in the movie.Cmon, Just admit it!!). He didnt get much screen time on the tv but he was just ultimately cool despite the fact he has no face. He was the right hand for megatron along side Starscream and Soundwave. 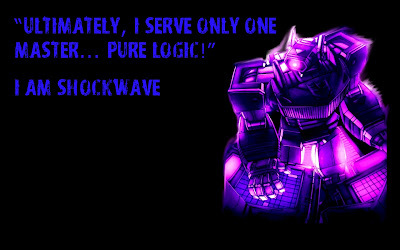 I fell sick today and couldn't go to work but still did some work with gimp and shockwave desktop background.